Summary of the address of Parampujya Sarsanghchalak Dr. Mohanji Bhagwat on the occasion of Sri Vijayadashami – on Tuesday 11th October 2016. After completing 90 years of the sacred Sangh work, the period of Yugabda 5118, i.e. 2016 C.E., in which we are celebrating the Vijayadashami festival, has a special significance. Last year I had mentioned about the Centenary celebrations of Pandit Deendayalji Upadhyay. The Centenary programs are going to continue this year also. This year we will be renewing the hallowed memory of more such greatest historical personalities, to follow whose life and teachings, we feel, is all the more important in the present conditions. This is the millennium year of Acharya Abhinavagupta’s life. A realised soul, he was also the foremost among the proponents of Shaiva Darsana. Along with propounding the concept of “Pratyabhijna,” being a multidimensional personality, he had even dealt with empirical subjects like poetry, drama, music, language and phonetics and made most authoritative, seminal and everlasting contributions to enrich such varied subjects. The theoretical analysis he presented on “sound” is not only a treatise that speaks on the efficacy of “sound” to lead one to God-realization, but also a subject for deep study for modern computer scientists. But, of all achievements, the greatest achievement of his lifelong penance was that he could resuscitate from the soil of Kashmir the salient feature of the Sanatana culture that helps one to see unity in diversity. And, in spite of being an ardent follower of the Shaiva school of thought, he had studied with utmost reverence the thoughts of other sects as well and imbibed their spirit. He gave the message of pious living and harmonious view field with love and devotion through his own life example and teachings, merged and became one with Shivatatwa, at a cave – the “Bhairav Gupha” – of Birwa near Badgaon in Kashmir. This is also the millennium year of the birth of the renowned saint from the south, great Ramanujacharya, the author of “Sreebhashya.” He, who had travelled on foot all the way from the south to Delhi to retrieve the festival idol of the revered deity from the Sultan’s court, had also shown the largesse to habilitate the Sultan’s daughter, who had turned into a devotee of the deity, in the temple. He had also thrown open the doors of Bhakti and Jnana for all, totally denouncing the differences of caste, religion, etc. Establishing social equality and practicing Dharma in its pristine form in his life, he was able to invigorate the sense of equality and fraternity throughout the nation. This year, we are also celebrating the 350th birthday of the tenth Guru of the Sikh Panth, Sree Guru Govind Singh, who had donned the dual-mantle of a statesman and a preceptor ( Meeri and Peeri) to protect the nation, society and Dharma, as also to uphold our self-respect and annihilate wickedness. Recalling the Guru’s total commitment and relentless struggle to the cause of the nation and Dharma, Swami Vivekananda also had exhorted the Hindu youth to emulate his example, in his famous address at Lahore. This year also marks the birth centenary of Prajnachakshu Sree Gulabrao Maharaj. He, who called himself the “daughter” of Sant Sree Jnaneshwar, had made painstaking study of our own as well as foreign works on spirituality and empirical sciences. During the shameful period of British slavery, he, through his irrefutable logic based on our own traditional wisdom and modern scientific theories, had established the loftiness of Swadharma, Swadesh and Sanskrithi, and reinforced our self-confidence. He had further made unequivocally clear through his voluminous works that the future progress of science, its humaneness, its meaningfulness and the harmonious synthesis of all the religions in the world is possible only by making our spiritual culture their foundation. If we carefully study the situation that we have been facing for the last one year, we will certainly be convinced of the need for us to follow the teachings of these four illustrious great masters. Although there is scope to accelerate development and more has to be done to fulfill certain aspirations, by and large, the policies adopted by the government have resulted in dispelling away the sense of disappointment previously discernible all over the country, and had built some measure of confidence, therefore the nation, it appears, is moving forward. At the same time it is obvious – and also expected in the democratic model we have adopted – that the political parties, who could not make it to the echelons of power, are busy formulating strategies for their political gains, to focus on the shortcomings and inadequacies of the government and the administration. In democracy this very thought-churning is expected to bring forth a consensus for the path of progress of the country and to serve as a tool for critical analysis, improvement and alert supervision of policies. However, the picture we have been seeing in the past one year, giving us a clear vision of the dirty tricks being played, is a matter of grave concern. Those who take even a cursory look at the situation prevalent in our country and the world at large, know that the fundamentalist, extremist, divisive, and selfish forces in the world, for whom an efficient, united and self-confident Bharat with an able government is an eyesore, are busy spreading their tentacles all over the country. Since we have not been able to fully eliminate the differences, divisions and the parochial feelings from our social life, once in a while, some untoward incidents happen here and there. Misusing such incidents, or fomenting trouble over them, or in the name of non-existent issues, these inimical elements, with the idea of maligning the government, administration and the benign forces like the RSS, which are capable of thwarting their evil designs, are dragging them into unnecessary controversies so to create a bad impression about them in the minds of the people. The aspirations and character of these forces, which are at loggerheads and even fight among them, clearly show that they even join hands to achieve their common or individual selfish aims. So, there is an urgent need to take necessary protective steps to guard against walking into the trap of their deceit and subterfuges, aimed at creating an atmosphere of division and antagonism in the society. Sangh Swayamsevaks have stepped up their efforts in this direction. In many states survey of existing condition with regard to social equality is in progress and efforts are also on to prepare people’s minds to find a solution to this problem through the Sangha Shakhas in various villages and locations. For instance, in the Prant called Madhya Bharat by the Sangh, detailed survey of 9000 villages has already been completed. It has come to our knowledge that presently, in 40% villages discrimination prevails on the issue of temple entry; in 30% villages discrimination prevails in the matter of sources of water; and in 35% villages discrimination prevails on the use of crematorium. And efforts are being made to find solution to these problems. Swayamsevaks have also started helping our scheduled caste and scheduled tribe brethren to claim the benefits guaranteed to them under the Constitution, and also to ensure that the government and the administration disburse the funds allocated for their welfare. Sangh Swayamsevaks, according to their strength, wisdom and capacity, would certainly strive to achieve social equality. At the same time, individuals and associations who stand for social good should become more active in the matter. It will certainly be a shame on the 21st century Bharat, if one’s own innocent kin have to bear insults and physical onslaughts, because of one’s wrath over a trivial issue or one’s superiority complex, which also facilitate the divisive forces to take benefit out of it to tarnish Bharat’s image and also to slow down the momentum of good social welfare activities being carried out all over. Protection, enrichment and growth of indigenous varieties of cows that form a significant part of our cattle wealth, is one of the mottos spelt out in the Directive Principles of our Constitution. And according to the belief and tradition of the Bharatiya society, it is a sacred duty. Not only the Sangh Swayamsevaks, but many saints and other people throughout the country are also carrying forward this work as a sacred mission, remaining strictly within the framework of the Constitution and law. Modern science has acknowledged the utility and greatness of indigenous cows. In many of our states, cow-slaughter and cruelty to animals are prohibited by law. But sometimes in some places in these states, the Go-sevaks have to do active campaigns to ensure proper implementation of such laws. But they cannot be compared with those undesirable elements, who raking up the issue of cow-slaughter or spreading unfounded rumours about cow-slaughter, are busy serving their narrow personal or political ends. Nevertheless, the sacred mission of the Go-sevaks would continue and gather momentum. In keeping with independent India’s democratic spirit and decorum, in spite of grave provocation, our law-abiding people have been carrying out all their activities without violating the law and they will continue to do so. While ensuring that the laws for the prevention of cow slaughter are flawlessly implemented and general law and order is also strictly maintained, administration should not weigh the law-abiding citizens and anti-social elements on the same scale. In the event of such incidents, politicians, while taking sides with an eye on political gains, along with ensuring that the moves they make do not lead to further widening the schism, should also see to it that their thoughts, words and deeds are helpful in lessening the feeling of hatred and ill-will and this is what society expects of them. Some sections in the media also, in the hope to enhance their commercial gains, are in the habit of sensationalizing the reporting of such issues by blowing them out of proportion, they have to resist this temptation. All have to bear in mind that freedom and equality could be achieved and consolidated only on the strength of the quantum and intensity of fraternal feeling in the society. And the nation will be in a position to face the challenges before it only on the basis of this strength. As dense clouds of threat to security, unity, sovereignty and integrity loom large even today, it is all the more necessary to take forward the tradition of goodwill promoted by great seers like Sree Abhinavagupta and Sree Ramanujacharya. The present conditions in the whole of Jammu & Kashmir make our concern all the more confounded. The diplomatic moves made so far at the international level, and the strong resolve of the government and the Parliament in the matter are welcome steps but to implement the policy with firmness is also important. Major areas of the Kashmir valley, Jammu and Ladakh are less disturbed and the situation in these areas is well under control. There is an urgent need to promote, consolidate and establish nationalistic activities and forces in these areas. To rein in the internal and external forces of disruption active in the disturbed areas, it is necessary for the Central and State governments as well as the administration to work in tandem, adopting a common policy, with a definitive attitude. There should not be any compromise whatsoever on the principle that the whole of Kashmir, including Mirpur, Muzzafarabad, Gilgit and Baltistan, is an inseparable and integral part of Bharat. There is an urgent need to rehabilitate with honor and security and ensuring all-round welfare, our Hindu brethren, who had migrated from those areas, and the Pandits, who were forced out of the Kashmir valley. During the partition, Hindus, who were domiciled in areas assigned to Pakistan, had migrated to Bharat and the then Jammu & Kashmir government had assured and asked them to settle in the state. They should be given all rights of citizenship in the state also. The discriminatory approach of the state administration towards Jammu and Ladakh also should be ended immediately. Only if the Jammu & Kashmir government and administration act with a nationalistic feeling, and perform in a clean, considerate, impartial and transparent way, the people of the state will certainly have simultaneous feeling of victory and confidence, and the process of assimilation of the people of the valley will move forward. Presently, the whole world is aware that the subversive activities constantly promoted from across the border are mainly responsible for the disturbances in the Kashmir valley. It has also come to knowledge that some groups active in the border areas of Bharat and having different countries of the world as the hub of their operations, indulge in subversion, violence, terrorism, smuggling of drugs and narcotics, are hand in glove with such elements. In such a situation, the terrorist attack on our Army camp at Uri has underscored the need for continuous preparedness on the part of our combat forces, and the level of perpetual coordination and cooperation needed among the Army, Defense Forces and Intelligence Agencies, as also the heavy price we have to pay even for a moment’s distraction. I heartily congratulate our Government and our valorous soldiers and all the wings of our Armed Forces, who, through an efficient and expert move, have given a firm and befitting reply to this wanton attack. This firmness and the efficiency shown in the matter of diplomacy and defense should permanently reflect in our policy. Keeping a watchful eye on the maritime boundaries as well as the frontier areas, the administration and the people should, with mutual cooperation, root out all forms of antisocial activities and the forces behind it. Full cooperation of the law and order machinery of the states, is also essential. In our country, we are following the federal system. While honouring and honestly implementing it, all of us, especially the leadership of our different political parties, in a honourable and credible way, should always remember that, whatever the system of governance and administration, and with all forms of diversity among our people, from time immemorial we have been one people, one country, one nation and in future also, we have to keep ourselves as one. Our thoughts, words and deeds should be to cement and further fortify this oneness, and not to weaken it. Those who give leadership in different walks of our social life, should be disciplined enough to display this sense of responsibility. Along with this, necessary mechanism should be put in place to prompt our people also to behave with this sense of responsibility. The discussions and deliberations going on during our country in the last many years on our educational policy- The purpose of education is to improve efficiency, developing the sense of responsibility, and cultivating national and social consciousness in an individual- is of great importance. And because of these efforts some sort of consensus seems to have emerged to the effect that educational facilities should be easily available and at cheaper cost. Education should equip an individual to earn his livelihood, make him self-reliant self-respecting and also make him confident about earning his livelihood. Along with acquiring knowledge and learning, he should have a sense of responsibility, congenial attitude as a citizen, and be a good person leading a life based on values. Education should be such as to meet these demands and the curriculum should be suitable to satisfy these needs. Training of teachers and planning about their welfare should be in a fashion to enable them to acquire necessary qualification and competence to carry out their sacred mission of imparting education effectively. Government and society should participate in the educational field and both should together guard against commercialization of education. After the new government at the Centre took over, a committee was appointed to go into the matter and the committee has already submitted its report. It remains to be seen whether the recommendations of the committee are in sync with the wisdom of the educationists and activists in the education field. The blueprint of a suitable framework required to bring about a shift in the direction would be available then only, or else, the consensus would remain a mere pipedream. However, for the education of new generation, along with what one gets from schools, colleges and universities etc., the atmosphere created by all sorts of social activities and programmes, from family to festival, are important places. Do friendly dialogues between the older and younger generations take place in our families? Do such dialogues lead to gradually cultivating the sense of social responsibility, personal and national character, respect for values, commitment to work, affection, and an urge to resist the attraction of vices, in youngsters so as to mould their character in a proper way? Do the elders by their behavior set an example for them to follow? Who else than we can find answers to such questions? Our experience shows that when children develop proper behaviour, aim and good tendencies at home, then only they work hard to pursue studies and show the discretion to put it to proper use. It is necessary that such dialogues should start and continue, and many saints, men and organizations are engaged in promoting such dialogues. In Sangh also, “Kutumbaprabhodan” is one such activity, in which our Swayamsevaks are very active. Rather than waiting for someone from outside to take the initiative, we have to start the process in our families on our own. Different programmes, festivals, campaigns, etc., being organised at the social level, are intended to impart social education and culture. But, at times, they lose their spirit and turn into hollow and meaningless rituals. If at all we take care to restructure them, keeping in mind the demands of the changing times, and organise them at social level, they will still prove to be the best instruments for social education. In Maharashtra, groups organising Sarvajanic (Public) Ganeshotsavas at many places have conducted many good experiments. Also, so many useful suggestions have come up regarding new-year (Varshapratipada) celebration. It is necessary to encourage, support and emulate usefully-reformed programmes and festivals. Some new initiatives have been made at the governmental and non-governmental level, and it is for social activists and our Swayamsevaks to motivate more and more people to take part in such activities. Keeping in mind the importance of programmes like planting trees, Swachchh Bharat Campaign, Yoga Day, etc. 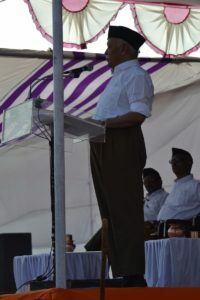 in cultivating social cohesion, social self-reliance, social feeling, etc., our Swayamsevaks have been taking part along with other people in such programme and, as a result, they have been able to add to the perfection of these programmes, apart from making them more attractive and effective. And we will continue to do so. The innate organised state of society is the root cause that ensures perfect order, integrity, peace and progress of a nation and the world, and it is on the basis of this truth, the Rashrtiya Swayamsevak Sangh has been working continuously for the last 90 years, and moving ahead. Traditionally, our society has been conducting itself with much diversity. Our dexterous ancestors had realized the eternal unity behind the many-hued diversity in the entire creation, underlying and pervading the apparent diversity. It was their extreme penance that led to the birth of our Rashtra as an instrument to teach this truth to the whole world, and it is to accomplish this sacred mission it continues to exist. As this teaching process has to continue till the end of creation, this Rashtra also will continue to live till such time. Hence, our Rashtra is called” Amar” or deathless. The world that is enmeshed in materialism and the cobweb of self-generated quarrels is once again in need of this teaching, and, on our part, this is the time for us to move ahead discharging our duty and prove the rationale behind our existence. Studying and understanding our Sanatana Dharma and culture, deeply entrenched on the strong foundation of the truth of unity of the entire creation, in the light of modern age, we have to present them as a living example before the whole world in its new form suitable for the time, location and circumstance, on the strength of our organized, mighty, non-exploitative, equitable, complete and rich national life. Emancipating ourselves from the wrongful influences caused by centuries-old slavery and self-forgetfulness, we have to formulate our national policies based on our own traditional genius. For this, we have to imbue our hearts with our great and lofty eternal values, ideals and culture. Through our life and deeds we must show to the world that, as a nation, we are marching ahead with self-confidence, finding answers to all sorts of painful problems that have been nagging the world for millennia. And this is the sum and substance of the message the great saint Gulabrao Maharaj has given us through his voluminous works and his life-long penance. The government should move in this direction with firmness, and the administration should implement the government policies in this direction with efficiency and enthusiasm, and both should perpetually ensure that, to the last man in the last row, everyone is happy, fine and safe and enjoys a life of contentment. On the other hand, the people also, remaining harmonious, organized and alert should help the government and the administration and, if needed, should exercise their control, which is necessary for the progression of our national life. If all these three entities move in tandem in the same direction with perfect planning and mutual understanding, then only we will be able to ensure our victory, defeating the evil designs, subterfuges and treachery of the demoniac forces and overcoming the difficulties and adversities we have been facing. The task is very difficult. But we have no other alternative but to accomplish the task. We have the legacy of Sree Guru Govind Singh, who, through his own illustrious life-example, has proved beyond doubt that even things that appear to be impossible could be achieved with strong commitment, valour, total dedication, detachment and selflessness. And it is for us to pursue this ideal with dedication, with all our might. Rashtriya Swayamsevak Sangh is the organization that is working for only this mission of infusing the Samaj with such divine qualities creating a helpful atmosphere by providing living examples. To organize every individual through selfless and unadulterated love and equip him to identify himself with the aim of taking this sacred Hindu Nation to the pinnacle of glory in the world, to make Sakha Sadhana that helps one to cultivate physical, mental and intellectual faculties through common and simple programmes, and to depute such “Sadhaks” according to their efficiency, as and when necessary, in different spheres of our national life to do the required work with a spirit of service, is the programme taken up the R.S.S. I have already briefly mentioned about the activities like Samarasata, Gou-samvardhana, Kutumbaprabodhan, etc., aimed at bringing about the required change in the Samaj urgently. But it is necessary for the entire society to become active in this direction. During the nine days of “Navatri,” gods – the noble human-force of that time- coordinated, harnessed and consolidated their might and, on the tenth day, decapitated demons like Chanda, Munda and Mahishasura to relieve humanity of their burden. And today is Vijayadashami, the festival of victory. Now before taking leave of you, along with praying to you for the soothing shade of your love and encouragement for the national mission taken up by the R.S.S., I also humbly solicit your increased cooperation and participation. देह सिवा बरु मोहे ईहै, सुभ करमन ते कबहूं न टरों. न डरों अरि सो जब जाइ लरों, निसचै करि अपुनी जीत करों..
अरु सिख हों आपने ही मन कौ, इह लालच हउ गुन तउ उचरों. जब आव की अउध निदान बनै, अति ही रन मै तब जूझ मरों..
O Shiva! Shower this blessing on me: I should never hesitate doing noble deeds. I should have no fear as I enter the field to fight the enemy: I should be determined to win. The addresses of both the chief guest and p.p.sarsanghachalak will definitely inspire lakhs and lakhs of swayamsevaks spread over bharat and world to rededicate themselves fot the rebuilding work of our nation and the world.